BELAZ Africa is a trade name widely used by MYNBOU RIGS AFRIKA (Pty) Ltd.. The company was founded in South Africa in 2009. Being relatively new the company inherited all positive values and achievements of the previous BELAZ’ dealers that worked in country beginning from the early 2000’s. The principal aim of the company have never changed and that was to promote sales of BELAZ product range in a market of R.S.A. and provide all necessary technical services. The company is a 100% subsidiary of Russian capital and the current shareholders of the company operate in the same industry as ourselves. 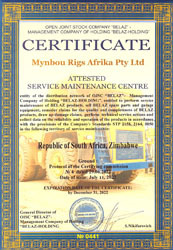 Head office of the company is located in Boksburg, Johannesburg with service depots in the towns of Kathu and Postmarsburg in the heart of the Northern Cape, a dedicated mining region of South Africa.